2003 ILE des CHENE NORTH STARSIle des Chenes began its run to the 2003 Canadian senior hockey championship by winning a three-team tournament in Manitoba that included La Broquerie Habs and the Warroad (Minn.) Islanders. The North Stars then travelled to Lloydminster and swept the hometown Border Kings three straight to earn the right to represent Manitoba and Saskatchewan at the Allan Cup playdown in Dundas, Ont. The four-team competition included the host Real McCoys, Stony Plain Eagles representing Alberta and B.C. and Lancaster ThunderCats for the East. After winning the Atlantic Canada title, the ThunderCats from New Brunswick eliminated Cambridge, Ont. in the Eastern Canada playoff. In round-robin play North Stars beat Lancaster 6-3 and Stony Plain 6-2, but lost 5-3 to Dundas. The 2-1 record put North Stars into the national final while Stony Plain earned a spot by shutting out Lancaster 3-0 in a sudden-death semi-final. The Manitoba team won the Canadian title with a 3-2 victory in double overtime. Although registered in Manitoba as an independent senior team, Ile des Chenes had been a dominant team in intermediate league play for many years and won six Hanover Tache Hockey League championships in the previous decade. 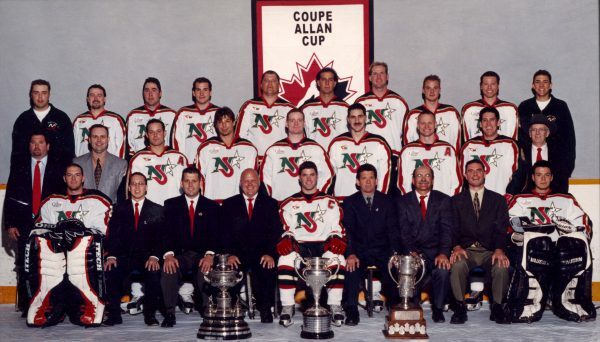 The team's only previous trip to the Allan Cup came in 1998.